While the Forest Service has reopened their previously closed land, both the City and County of Santa Barbara have decided to keep their portions of the burn area closed. You can read more details on the Noozhawk article by Ray Ford. 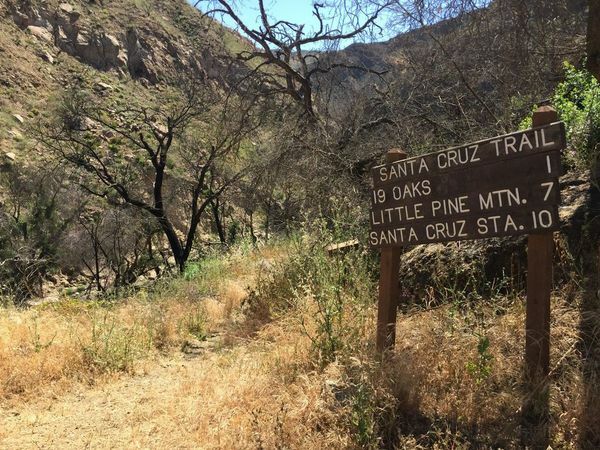 The City and County of SB control much of the lower portions of the Santa Barbara Frontcountry, including the trailheads at Cold Spring, San Ysidro and Hot Springs Canyon. This means that while the upper Frontcountry within the Los Padres is open, people cannot access the trails through the more popular lower trailheads. This has created a bit of a conundrum as stakeholders and trail-users attempt to figure out the best ways to legally enjoy the trails. We’ll keep you posted as news develops…….. The LPFA has been busy over the past days installing yellow warning signs at the trailheads around the Thomas burn area, see photo below. Please do be careful if you are within the burn area. There are many loose rocks and hazard trees that have not succumbed to gravity quite yet. Pay special attention on switchback sections where people above might trigger a loose rock on trail users below. Also, if you plan on camping in the burned area, be really careful of hazard trees and limbs that might fall. Portions of the town of Montecito remain in a state of disrepair as they continue to deal with repercussions from the Thomas Fire and January 9 debris flows. There is still a lot of heavy equipment moving rocks and pushing dirt, and some shocking house damage remains within the community. Please be mindful and respectful. The Romero Camuesa Road from Romero Saddle down towards Pendola remains closed to vehicles/motorcycles as does Divide Peak OHV. Hikers and bicyclists are able to use these roads. No timetable has been set as to when the road and OHV route might reopen but don’t count on it happening anytime soon. Both Rose Valley Campground and Middle Lion Campground remain closed. No news as to when they might reopen. While the forest is open, most of the trails have received little or no trail work since the winter rains. You should plan on the trails taking significantly longer to travel than normal and be careful attempting shuttle trips as there may be some impassable sections of trail that may cause changes in your plans. There have been some reports from within the burn area of the dreaded fire-follower plant called the Poodle Dog Bush. Our unfriend, the Poodle Dog, causes human reactions similar to poison oak. It’s a very picturesque purple flower that can grow in large robust fields that look like something you should dance through rather than skirt around. Google search it please……. Other than that, the forest has been reopened from the lower Sespe out to Gibraltar Road and up to Hwy 33. Enjoy, be safe and please let us know if you come across any downed trees or horrible sections of trail that need significant work. We’re helping compile a list of trail issues and any assistance you can provide would be greatly appreciated. Please share your reports on www.HikeLosPadres.com. THANKS and be safe! 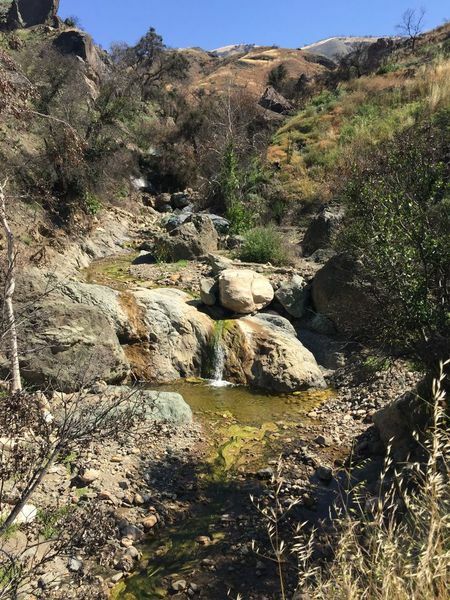 The LPFA will also be hosting a trail project on June 2 along the Davy Brown Trail, off of Figueroa Mountain near Los Olivos. We’ll be meeting at the upper Davy Brown Trailhead at 8am and from there working down Davy Brown and perhaps out the Willow Spur Trail. Work will be mainly clearing downed trees and brush from along the trail. Mike Smith is the project leader and we’ll work until the afternoon before returning to the trailhead. Davy Brown is one of the more scenic trails in the area providing ocean views from the trailhead as well as views of Hurricane Deck. It’s also home to a great variety of plants and flowers that make Figueroa Mountain so famous. We hope to see you there. Please RSVP if you can make it (INFO@LPForest.org) and click here for more details. Mark Subbotin will be leading a sawyer assault down the Boulder Canyon Trail along the northern slope of Pine Mountain. There is an estimated 20+ trees down along the trail and we’re fairly certain they’ll get them all! This is also part of the Condor Trail. Details will be provided by Mark and the Mt Pinos Volunteers, you can reach Mark at: MSubbotin76@Gmail.com. The VWA is hosting a car-camping potential multi-day project along the Horsepasture Trail. They’ll be working hard on Saturday and then playing equally hard on Sunday. Sounds like a great project and a terrific way to get to know the area and the people who help keep the trails open. RSVP required, please click here for more details. • As if this weekend wasn’t busy enough, the Wheeler Gorge Visitor Center is hosting a special talk on Saturday at 11am by local hiking author Dr. James Caballero entitled “Hiking Be Prepared”. It doesn’t matter if you are a seasoned hiking stud or a trail newbie, you’re assured to learn something new! See you at Wheeler……. and stay for the REI BBQ! • GREAT NEWS! 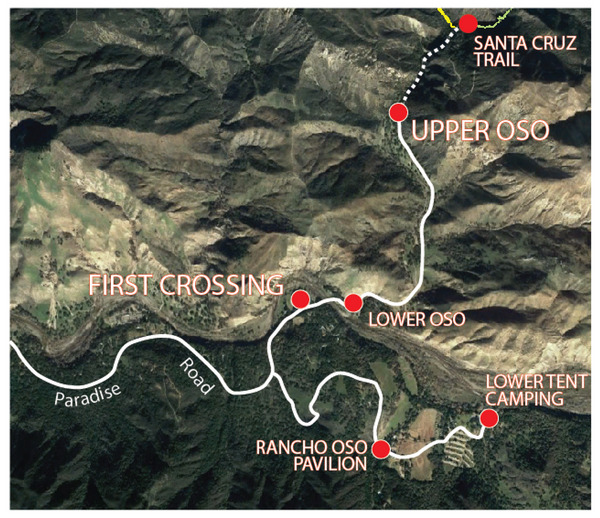 The Ojai Ranger District released a scoping letter last week outlining an environmental proposal to approve all the ORD trails for Level 1-2 trail maintenance. See attached letter to learn more and please respond if you’d like to see the Ojai trails improved. • This weekend marked the launch of a temporary shuttle service that shuttles visitors from the Big Sur Station parking lot down to Pfeiffer Beach and back. Beach access to Pfeiffer and overcrowding has been a serious problem over the past decade and the shuttle service is a pilot project to see if a shuttle can prevent traffic jams along Sycamore Canyon Road. By most accounts the first weekend was a big success. We’ll share more information on this in a future email. Pay Attention to the Thomas Fire Warning Signs, and Especially Pay Attention to the Signs of Thomas Fire Warnings, photo Gordon J.
Hello Friends – Happy Mother’s Day! It’s been a while since we’ve sent out a LPFA Forest update and we figured what better day to send out a Los Padres update than Mother’s Day. Lets get to it……. We’ve all heard the saying about if a tree falls in the woods and no one is there to hear it…….right? While we can’t exactly prove that one, we can tell you that if a tree is obliterated in the woods by a rock slide and someone is there to hear it…… it’s scary and loud as hell! On a recent trail survey up Rancho Nuevo Canyon, one of our volunteers witnessed first hand a rock slide that literally destroyed and smashed a substantial oak tree into pieces. The volunteer watched in astonishment from less than 50 yards away as the cliff face let loose down the canyon, taking out trees and covering the trail that he was seconds away from hiking. After the dust had mostly settled, he quickly took a photo of the carnage (see above) and high-tailed it out of there. It was a crystal clear cool spring morning, no wind, no earthquakes, this area hadn’t burned since the Zaca Fire and no recent rain. Fortunately, there had been a few smaller rock falls just before the final large one that kept him from continuing down the trail and into the cross-hairs of the slide. The main takeaway of the story is to always pay attention while in the forest. It doesn’t need to be a stormy day for disaster to strike. We might want to put the headphones away, listen to the forest sounds, stay alert and follow your gut. 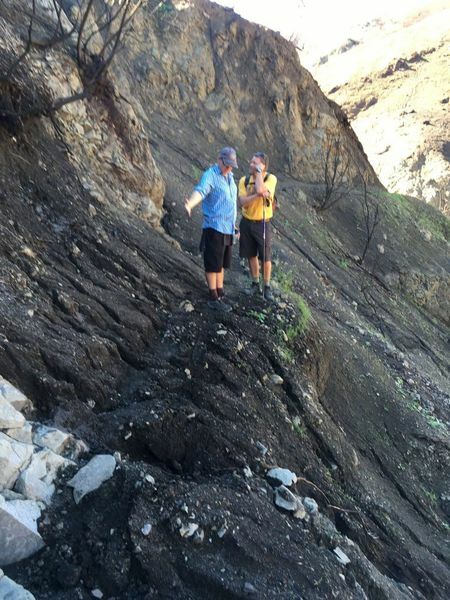 While the slide was scary for sure, it must have been an incredible sight to see as well…… Has anyone else witnessed tree falls, rock slides or other random acts of nature in the Los Padres. We’d love to hear about it….. While not part of the Tour of California, the Blue Canyon switchbacks are looking good enough to ride again! Compliments of a February 2018 LPFA volunteer project. This stage might as well be called the Tour de Thomas Fire. It starts in Ventura, heads out through Oxnard and Camarillo before heading north up Hwy 150 through Santa Paula literally right past the point of origin of the Thomas Fire. From there the race goes through Ojai, passes the Ojai Ranger District, along Hwy 150 to Carpinteria, across to Santa Barbara and then ascends freshly paved Gibraltar Road into the Los Padres and up to the finish at East Camino Cielo. The riders will be seeing most of the burned areas during their 100 miles in the saddle. Gibraltar Road is sure to be a wild scene for those who’d like to see the race in person, otherwise you can watch on NBCSN live from 1 – 4pm. The following day the Tour heads to the northern Los Padres starting in King City near the Monterey Ranger District. From King City the riders will circle around to Greenfield, head towards Arroyo Seco, veer onto Carmel Valley Road, passing briefly through the Los Padres on their way to Carmel Valley and finally north up to the finish at Laguna Seca Raceway. In all the riders will cover 122 miles and you can catch the live TV coverage from 1:30 – 4pm on NBCSN. Imagine if there were no trail volunteers, I wonder if you can…. Sadly, we’re nearing the end of the regular season for Los Padres volunteer projects. Soon the temperatures will get too hot, the water will fade away and many of us will head east to higher and greener summertime pastures. BUT NOT YET! We’ve got a bunch of upcoming trail projects across the LP through mid-June highlighted by National Trails Day on June 2nd weekend. As usual, a full list of volunteer trail opportunities is outlined at the bottom of this email as well as some specific events with details posted here. If trailwork is not your thing but you’re still looking for ways to volunteer, the LPFA is always looking for help with administrative tasks, website updates, helping organize events and/or providing information for public forest-users. If you’ve got the time and interest, we’d love to hear from you. Contact us at INFO@LPForest.org for more information. THANKS……..
• Since it is Mother’s Day, we wanted to reach out to each and every mother out there and send our thanks and best wishes! You are all the best……. • Tragically, a mountain lion was killed along Hwy 101 near San Luis late last month. Error: Error validating access token: Session has expired on Tuesday, 26-Mar-19 15:28:48 PDT. The current time is Tuesday, 23-Apr-19 23:47:35 PDT.